Authors: Flinspach, M.L., Li, H., Jamal, J., Yang, W., Huang, H., Hah, J.-M., Gomez-Vidal, J.A., Litzinger, E.A., Silverman, R.B., Poulos, T.L. 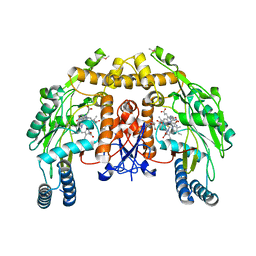 Cite: Structural basis for dipeptide amide isoform-selective inhibition of neuronal nitric oxide synthase. Authors: Flinspach, M.L., Li, H., Jamal, J., Yang, W., Huang, H., Hah, J.M., Gomez-Vidal, J.A., Litzinger, E.A., Silverman, R.B., Poulos, T.L. Authors: Li, H., Flinspach, M.L., Igarashi, J., Jamal, J., Yang, W., Gomez-Vidal, J.A., Litzinger, E.A., Silverman, R.B., Poulos, T.L. Cite: Exploring the Binding Conformations of Bulkier Dipeptide Amide Inhibitors in Constitutive Nitric Oxide Synthases. 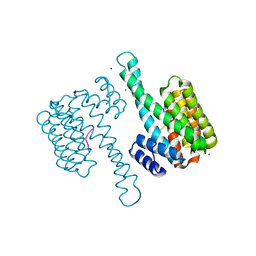 Authors: Flinspach, M., Li, H., Jamal, J., Yang, W., Huang, H., Silverman, R.B., Poulos, T.L. 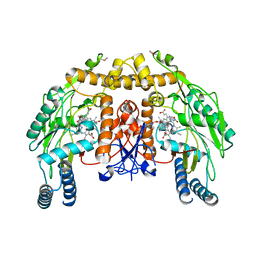 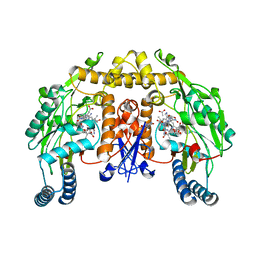 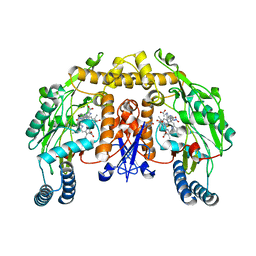 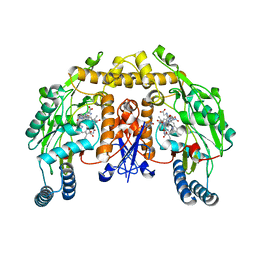 Cite: Structures of the Neuronal and Endothelial Nitric Oxide Synthase Heme Domain with d-Nitroarginine-Containing Dipeptide Inhibitors Bound.